2018 CoNECD Overview - Women in Engineering ProActive Network, Inc.
For 2018, The Women in Engineering ProActive Network (WEPAN) joined forces with three other organizations to host a new diversity conference called CoNECD (Collaborative Network for Engineering and Computing Diversity). The vision of CoNECD is to provide a forum for exploring current research and practices to enhance diversity and inclusion of all underrepresented populations in the engineering and computing professions including gender identity and expression, race and ethnicity, disability, veterans, LGBTQ+, 1st generation, and socio-economic status. The conference took place in Crystal City, Virginia, just outside Washington D.C. from April 29th-May 2nd, 2018. 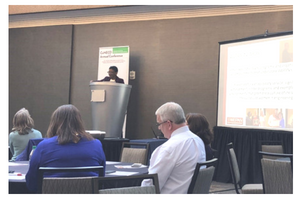 The conference was a collaborative effort between WEPAN, the National Association of Multicultural Engineering Program Advocates (NAMEPA), the Minorities in Engineering Division of ASEE (MIND) and the Women in Engineering Division of ASEE (WIED). 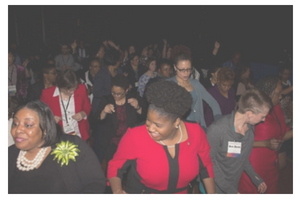 The conference provided opportunities for over 400 attendees who came from many backgrounds and work environments to collaborate, learn and engage with a wide range of diversity and inclusion advocates. Because research and practice are necessary for creating diverse, inclusive, and equitable environments, papers and presentations from both researchers and practitioners were incorporated into the conference sessions. On Sunday, April 29th several workshops were offered to CoNECD attendees, including two that were led by WEPAN members. Lora Leigh Chrystal presented a workshop titled "A Director’s Guide to Creating and Sustaining Successful Women in Engineering Programs". This workshop was developed around a resource of the same name created by WEPAN about twenty years ago. Dr. Roger Green also lead a workshop titled "Men Allies for Gender Equity" which focused on developing vocabulary, actions and practical skills that promote gender equity. The Conference officially kicked-off on Sunday evening with an opening reception which included an engaging game of human bingo, hors d'oeuvres, and prizes. It was a great opportunity to catch up with friends and colleagues and meet new people in a fun, relaxed setting. Bev Watford, Chair of the inaugural CoNECD Conference, welcomed attendees to the conference, introduced the event and shared the story of how the conference went from an idea to reality. Each morning began with continental breakfast and a variety of keynote speakers. Dr. Allison Scott who is the Chief Research Officer for the Kapor Center for Social Impact, was the speaker on Monday morning. Dr. Scott leads a research team focused on enhancing diversity in the tech ecosystem. Later on Monday, over 300 people attended the WEPAN Hi-5 lunch which included nine different engaging, fast-paced presentations on a variety of topics. Dr. Sheila Ross coordinated the details of the event and Lora Leigh Chrystal introduced the event which received very positive reviews from conference attendees. Monday evening provided WEPAN members and other conference attendees the opportunity to hear from Amy Freeman about what’s happening within WEPAN at the Town Hall meeting. In addition, WEPAN’s annual awards were presented at this meeting. 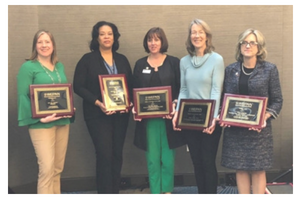 2018 award winners are posted on the WEPAN website. Conference attendees had a variety of session topics each day to select from including: University Faculty; Undergraduate Education; Race/Ethnicity; Gender; Disability; Veterans; LGBTQ+; Computing; First Generation College Students; Graduate Education; Diversity Research; Pre-K12 and Socioeconomics. Time was also provided each day for networking and several round table discussions were available. Tuesday morning included a panel facilitated by Laura Bottomley from North Carolina State University. The title of the session was "What’s Our 'Time’s Up' Moment?" Tuesday’s activities provided space for business professionals to engage at the conference through sessions specifically designed around topics relevant in industry. Tuesday ended with a dinner banquet and dance party. It was entertaining and provided a festive way to bring people together for the last evening of the conference. Wednesday morning’s speaker was Ms. Toni Carter, Inclusion and Diversity Lead for Idaho National Laboratory where she oversees efforts to implement an inclusive work culture for the lab. One session track was offered Wednesday, along with the final wrap up for the conference including an open discussion about what went well, what didn’t go well, and suggestions for next year. The conference concluded at 1:00 PM. Planning for the 2018 Conference is underway!